Clear skies this evening. A few showers developing late. Low 47F. SSW winds at 10 to 20 mph, decreasing to 5 to 10 mph. Chance of rain 30%..
Clear skies this evening. A few showers developing late. Low 47F. SSW winds at 10 to 20 mph, decreasing to 5 to 10 mph. Chance of rain 30%. Brown and his wife, Shelly, raise crops and livestock with their son, Paul, and his long-time girlfriend, Shalini, who also works at Brown farm/ranch located east of Bismarck. They have a daughter, Kelly, who lives and works in Fargo, but comes home to help when she can. “Dirt to Soil: One family's journey into regenerative agriculture,” and it is out now at bookstores. Soil at the Brown farm filled with many microbes, and other biology underneath the soil. Gabe Brown’s book, From Dirt to Soil. For more, see http://brownsranch.us or on Facebook at https://www.facebook.com/brownsranch. Gabe Brown, a producer and winner of many state and national soil health awards, wrote the tale of his family’s ag journey to soil health and the resultant new direct marketing schematic of his farm/multi-livestock ranch. The book is named “Dirt to Soil: One family's journey into regenerative agriculture,” and it is out now at bookstores. Brown has travelled all over the world freely talking about soil health and how to get there. While he has given many soil health presentations and wrote articles about it, producers and others asked him to write his soil health journey down in a book. The story starts with the Brown's purchase of the farm in the early 90s. They immediately suffered four back-to-back years of hail and drought. With nothing for crops, revenue was low and the bank turned them down for a loan. It might have been bad luck at the time, but it forced the family to learn to farm and ranch differently and take marketing of their high-end products into their own hands. The soil was key to it all. 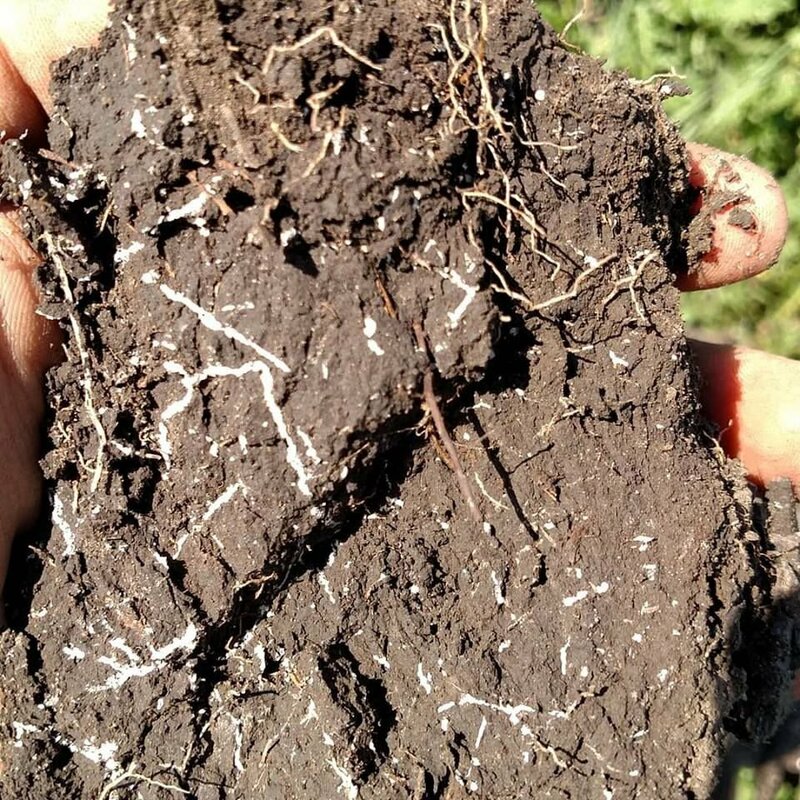 “We went on a 20-year journey of finding out how soil functions and should function,” Brown said. Along the way, the Browns kept an open mind, learned from others, tried many new and innovative ideas, and discovered how important the decisions they -and all producers - make were for the water quality, the ecosystems and soil health throughout the world. Today, the Brown operation is a model for many others who are struggling with how to function in today's agriculture when all seems stacked against the family farmer. Brown calls organic matter a “revolving nutrient bank account.” Organic matter, which takes decades to increase, has greatly improved on the farm/ranch, through the use of diversity of crops, forages and multi-livestock grazing, dual and companion cropping, use of manure, no-till farming, livestock as harvesters, planned grazing system, cover crops, keeping the soil covered and having a living root under the soil, ensuring a multitude of organisms thrive under the soil, utilizing strong soil residue/armor and following and improving on many other soil health principles and guidelines. “We took organic matter that was between 1.7-1.9 percent, and improved our soil to where 20 years later, it is now 6.9 percent,” he said. Because of the improvement in OM, they have excellent water holding capacity and water infiltration. In 1991, the infiltration rate was a half-inch of rain an hour, and now, water infiltrates at 1 inch in 9 seconds throughout the farm. Water that doesn’t infiltrate well sits in a pool on the surface, and is not available during dry spells when plants need it most. “We had plenty of hay, and plenty of grazing pasture,” he said. Their farm has not used synthetic fertilizer or fungicides since 2001, yet they have been profitable every year. This year, the Browns raised beef, pork, lambs, eggs, and for crops and hay, rye, hairy vetch, oats, peas, lentils, barley and flax. The Browns direct-market nearly everything they produce and they sell many of their crops for seed. They provide products to a food co-operative and sell online, where the products are delivered by Speedy or other transportation to some 8,000 customers.